It’s a Wednesday afternoon at the public library. A children’s librarian leads a storytime for elementary-aged students in the program room; a small group of teens works together to create a zine in the library’s makerspace; a boy asks a library staff member how to find new graphic novels to read; and a teen librarian chats with a cluster of high school students about their homework. This is not a school building. There’s no classroom or homework or examinations. There probably aren’t any formal lesson plans or schedules. And yet, in each of these interactions and activities, there is the potential for learning to occur. When I (Jim) was a student teacher in my last semester of my undergraduate degree and started to consider Graduate School for Library Science, a part of me worried I wouldn’t have the same impact on kids and teens as a librarian that I would as a teacher. Only now do I realize that “librarians” and “teachers” are not mutually exclusive terms. Gone are the days when librarians’ only responsibility was to check out books to patrons. More than 100 years ago, John Cotton Dana, one of the first city librarians, said, “The public library is a center of public happiness first, of public education next,” (Dana, 2015). This remains true today as we strive to both cater to the existing interests of library patrons and expose them to new experiences and skills. Librarians are developing more formalized roles as instructors in academic, school, and even public libraries. In this chapter, we will explore the instructional role of public librarians with an emphasis on what exactly they are teaching. To give us some context for this discussion, we’d like to share an extended example of one ongoing public library program in Charlotte, North Carolina. As you read about this program over the next few pages, ask yourself: what are participants learning by attending this program? I have advocated for benefits of gaming in the library when it comes to young patrons since starting my position as a teen specialist. When I came to Beatties Ford, I wanted to start a Dungeons and Dragons (DnD) group for teens, but there were doubts about interest because of the population we serve. The Beatties Ford Road area is a low-income part of Charlotte; most of the families in the area are working class and African American with not much opportunity for economic mobility. Many of our teens have never heard of role-playing games (RPGs), let alone Dungeons and Dragons, so it was several years before I actually went through with planning for Dewey and Dragons. The program started about a year ago when one of my regulars expressed an interest in DnD. He had never played himself but had heard about it from one of the gamers he watched on YouTube and wanted to play. I have been familiar with DnD for some time and knew that the skills associated with playing would make it an easy pitch to my team lead and supervisor. Fostering imagination, acute problem-solving, storytelling, quick math, and teamwork were all goals that I pitched to my superiors, who allowed me to run the program. Our first attendees were the initial teen who was interested and two of his friends. Teens at the Beatties Ford Road Regional Library participate in a Dewey and Dragons session. Photograph provided by Jamey Rorie. Now, we hold Dewey and Dragons every first and third Thursday. We have a volunteer Dungeon Master who is excellent at teaching newcomers and handling veterans. Our volunteer comes in and prepares for the upcoming session, and our teens come in later and begin the campaign. There is a recap of the previous session, and those who are new to the group are given premade characters and a general idea of how to play. The sessions last for two hours, and we livestream them to our Facebook page. After the session, our volunteer asks newcomers if they are interested in creating a character for next time and goes through a step-by-step explanation of building their character. A lot of our teens model their characters after manga that they are reading or anime they are watching and continue developing their character over time. Some of our more artistic teens have drawn their characters and posted them online. The ability to take this personal avatar that they created and help shape the game’s story is really appealing to our teens. If a teen makes it to two sessions in a row, they are given a set of dice of their own. It’s our way of welcoming them to the group officially. 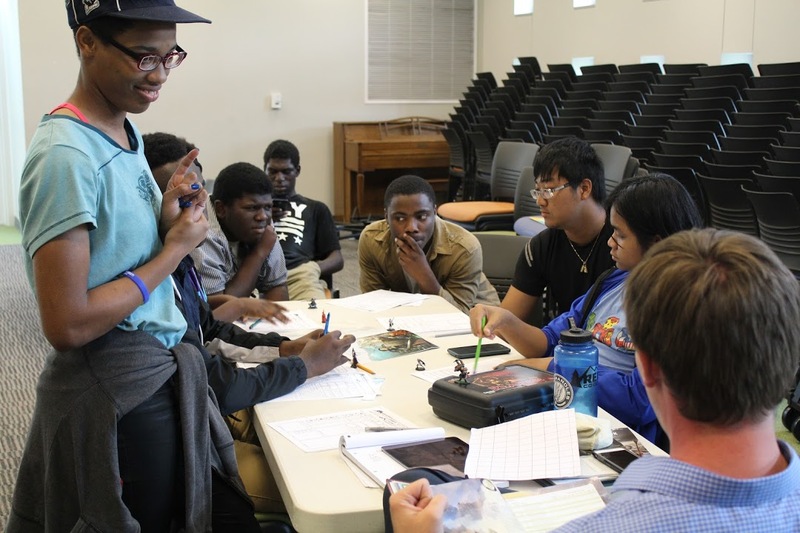 Since starting Dewey and Dragons, we have grown from three players to an average attendance of seven teens per session. We have also had adults participate. The teens who participate have been our best advertisements. Other teens have seen them playing and wanted to know what it was about. On many occasions, we have had upwards of 12 teens show up to play. The success has led to a new problem of too many players for our volunteer Dungeon Master to handle, resulting in us having to require registration and in some cases turn away teens who have shown up. We are looking into getting a backup Dungeon Master to prevent this (ideally, one of our teens). After a session, I can hear our teens talking about their adventures. They discuss what they would have done differently and what they are planning to try next time. Most are used to reading stories, watching movies, or playing videogames that have a set ending and story beats. But with DnD, they determine what happens to their character along with others who have that same sense of freedom. They get to determine how the world sees their character and how they or their character would react to a certain situation. Would they play it out strategically, or would they go in sword swinging and face the consequences? There have been long debates at the table of what an action could result in, not only for the individual but also for the group as a whole. A number of my regulars have started reading fantasy-based material, like the manga Re:Zero and Sword Art Online, or graphic novels and books based off of Dungeons and Dragons, like the Legend of Dirizzt, as a result of our program. Some who have never considered reading or interacting with the fantasy genre have shown interest in relation to DnD. In a formal educational setting, identifying the content that is taught and learned—the “what” of instruction—is a straightforward task. The school day is divided into segments by subject area; each subject area, in turn, is shaped by a set of standards that set the benchmarks for what students should know and be able to do as a result of a lesson or unit of instruction. These standards are neatly organized by grade level and often packaged within a pacing guide that tells teachers which standards they should focus on in each part of the school year. For example, the Common Core State Standards Initiative (2010) states that by the end of third grade, students should be able to “ask and answer questions to demonstrate understanding of a text, referring explicitly to the text as the basis for the answers” (p. 14). Instruction within school and academic libraries is also governed by one or more set of learning standards. In K–12 school libraries, these are typically the National School Library Standards (American Association for School Librarians, 2017) or a state-specific alternative. Academic (college level) library instruction is guided by the Association of College and Research Libraries’ (2015) Framework for Information Literacy for Higher Education. Like other standards documents written for formal learning environments, these texts define the “what” of instruction in school and academic libraries (we will look more closely at the content outlined in these documents later in this chapter) . In education, the term “standards” refers to a set of benchmarks that specify what learners should know and be able to do at each grade level. “Curriculum” is what actually happens in the classroom to help students reach the standards. Any given standard can be taught and learned in a variety of ways; it is the teacher’s job to translate standards into curriculum. At least for now, public libraries lack a centralized set of learning standards that might help us understand and guide the content and skills that are taught in these spaces. However, the Young Adult Library Services Association (YALSA) recently took a major step toward the creation of such a document with its 2018 release of the Teens First: Reimagined Library Services for and with Teens infographic (https://bit.ly/2kuUdoD) and learning outcomes (https://bit.ly/2EgqUvP). YALSA describes the Teens First infographic and accompanying resources as representing a “paradigm shift” for public libraries (Young Adult Library Services Association, 2018b, para. 1). The infographic describes six target areas in which public librarians can contribute to teens’ growth and development: Leadership, Learning, Community, Creativity, Digital Citizenship, and Literacies. For each of these target areas, YALSA has written 5-9 possible learning outcomes “to assist library workers in setting learning goals for teen programs” (Young Adult Library Services Association, 2018a, p. 1). For example, in the Creativity domain, one learning goal is for teens to be able to “create original work or responsibly remix existing content to make something new.” Additional learning goals from this document will be discussed later in the chapter. The YALSA learning goals are written specifically for teen learners; there is no current equivalent for children’s library services. However, many of the YALSA learning goals would be appropriate for planning children’s instruction, as well. In addition to these YALSA documents, professional competencies documents published by YALSA, the Association for Library Service to Children (ALSC), and the International Federation of Library Associations (IFLA) also allude to the content that can be taught in a public library context. These documents all describe benchmarks for public library services to children and teens rather than learning goals for the children and teens themselves. However, by looking at the standards in these documents that address education, we can begin to get a sense of the content and skills that these organizations describe as the “what” of public library instruction. The most recent ALSC competencies document (Association for Library Service to Children, 2015) includes several statements related to the instructional role of public librarians (for a complete list of these, see Table 1 in the introductory chapter). Among these are Competency 2 in the Reference and User Services category, which states that a competent children’s services librarian “instructs and supports children in the physical and digital use of library tools and resources, information gathering, and research skills” (n.p.). Literacy development is also included in this document as an area in which public librarians play an instructional role. In addition, the YALSA document also states that in the public library, teens can “develop social competence … imagination and creativity … creative skills and multiple literacies” (pp. 7–8). Finally, YALSA asserts that in the public library, teens can learn “critical thinking, problem-solving, intellectual openness, and multiple literacies” (p. 9). The IFLA guidelines for library services to children and teens were last revised in 2003 and 2009, respectively, and offer less guidance on the content of public library instruction than the ALSC and YALSA documents. This is not surprising, since the public librarian’s instructional role has only just begun to be seriously discussed by other professional organizations within the past few years. Still, IFLA’s Guidelines for Children’s Library Services (2003) does state that libraries should offer “training in library skills and information literacy” (p.13), while the Guidelines for Library Services to Young Adults (2009) asserts that libraries should “assist young adults in acquiring the skills to effectively access all library resources and become information and computer literate” (p.3). Looking holistically across these documents, three categories of learning goals are apparent: goals related to information literacy, goals related to traditional literacy, and goals related to dispositions. In the remainder of this chapter, we will discuss each of these categories, referring to the Dewey and Dragons example and bringing in other real-world examples to highlight how these learning goals are already being translated into instruction in public library settings. As this definition points out, information literacy skills are critical not only in the classroom but also in daily life. Formal research of the type conducted in school settings is only one application of information literacy skills. Other, arguably more critical, applications include finding, evaluating, and using information in daily life; organizing and managing personal information; understanding how, why, and to what effect information (such as news reports) is created and shared; and acting on information to build communities, engage in activism or advocacy, and improve one’s own life. It is with these personal and community-oriented applications of information literacy, which are not currently emphasized in school settings, where the public library can have the most impact. For an example of this type of activism-based instruction, see the spotlight box below. articulate their learning to peers and adults (Young Adult Library Services Association, 2018a, p.1). Many of these information literacy goals relate to technology. Just as our library spaces have changed over the years, so, too, have the ways in which we access and interact with materials. The number of digital resources (e-books, music downloads, movie streaming, etc.) libraries circulate has grown exponentially and continues to do so. Technology is constantly changing, and people must adapt and learn to keep up. Many will turn to first to their local library to access and become proficient in these ever-changing technologies. For kids and teens, new technology can’t come fast enough. But as YALSA reports, “data suggests that while teens are comfortable with new technologies, they are not always as technically savvy as adults believe them to be” (YALSA, 2017a, Digital Literacy section), so it is important for library staff to avoid “digital native” assumptions. Libraries of all types have long been associated with books, and even as libraries have expanded their resources and services, reading remains a core focus of our services. However, librarians are not reading teachers; our role in literacy development is not to teach the mechanics of reading and writing. Instead, librarians serve as curators, connectors, and catalysts, helping to engage learners with texts. The American Association of School Librarians (AASL) states that librarians should “initiate and elevate motivational reading initiatives by using story and personal narrative to engage learners. [They] curate current digital and print materials and technology to provide access to high-quality reading materials that encourage learners, educators, and families to become lifelong learners and readers” (American Association of School Librarians, 2017, p.3). When we explore the question of what public librarians can and should teach related to traditional literacy, we need to be sure to keep this distinction between reading teachers and librarians in mind. Rather than teach learners how to read and write, our role as librarians is to teach them how to identify their own reading and writing interests – in part by exposing them to as many diverse texts and writing styles as possible. Existing programs like summer reading challenges already exemplify this type of learning in public library settings. Formal learning is typically focused on content that is external to the learner—content that improves the learner’s understanding of the world around them. In contrast, when we teach for dispositions, we are helping learners understand and improve themselves and their communities. A disposition can be defined as a characteristic attitude, outlook, or habit of mind. Since dispositions are not usually explicitly taught in formal learning environments, this is an area where public librarians can make a significant impact in the lives of their young learners. Compared to a program that aims to teach students a discrete skill or piece of knowledge, planning for programs and experiences that will help learners develop these dispositions can be challenging. Later in this book, we’ll discuss instructional planning and design frame-works that will help you plan for this type of learning. For now, consider the Dewey and Dragons program highlighted at the beginning of this chapter. What dispositions are learners strengthening through their participation in this program, and how does the design of the program foster that growth? When dispositions are used to formulate learning goals, it is important to keep in mind that this type of instruction may be especially prone to deficit-based thinking that blames children and their families for perceived character flaws (for more on deficit- vs. asset-based instruction, see Chapter 5). Take, for example, the much-debated concept of “grit.” Psychologist Angela Duckworth, the most famous proponent of the concept, defines grit as “perseverance and passion for long-term goals” (Duckworth, Peterson, Matthew, & Kelly, 2007, p. 1087). Teaching and assessing for grit has become commonplace, especially in high poverty schools. Many researchers have pointed out problems with the grit narrative, however. These scholars argue that the concept of grit romanticizes suffering and hardship and places the responsibility for changing those conditions on the people living in them, rather than on the inequitable and oppressive systems that created them in the first place. In addition, the discussion of grit within the education field has been almost entirely focused on students in poverty and students of color, implying (incorrectly, according to existing research) that wealthier white children already possess this disposition (Strauss, 2016). This cautionary advice is not meant to discourage you, or our professional organizations, from including dispositions as a key component of the “what” of public library instruction. Objections to the grit narrative are not focused on the concept itself – young people do need perseverance and passion. Instead, these objections are focused on how the concept has been used as a tool to perpetuate damaging narratives about poor students and students of color. As you explore how you might teach these dispositions to your public library learners, ask yourself: am I assuming the best about the children and teens in my community? Am I teaching this skill in an equitable and culturally sustaining way? The material in Chapter 5 of this book will help you answer those questions. So far in this chapter, we have focused on the content, values, and perspectives that we might explicitly set out to teach in public library spaces – what we could call the “formal curriculum” in educational terms. While it’s necessary and valuable to spend time thinking and talking about this formal curriculum, we also need to attend to the “hidden curriculum” within our libraries – “the unwritten, unofficial, and often unintended lessons, values, and perspectives that students learn” in a particular environment (Great Schools Partnership, 2014, para. 1). In any learning environment, students will absorb not only what we overtly set out to teach them, but also “lessons” such as how they should interact with others in the space, what behaviors are considered acceptable, what expectations adults have for them, and how to view and respond to cultural differences. Consider a library programming space where learners are greeted with a large poster listing prohibited behaviors in the room (“No food,” “Leave cell phones outside,” etc.). Inside the space, the walls are decorated with “Read” posters, all of which feature white celebrities. A security guard hovers just outside the space. The librarian leading the program does not ask for or use participants’ names, and all the materials used within the program are written by male authors. Although that program might have been intended to teach a skill, such as research strategies, that is not all learners would take away from such a program. They may leave with the understanding that the librarian assumes or fears that they will behave badly, that the library doesn’t value individual children or teens, or that the library doesn’t value the contributions of diverse cultures. When we plan instructional experiences in our library, regardless of their format, we need to consider not only the overt content we intend to teach, but also the implicit content that we may communicate through our own behavior, the library’s policies or space, the materials we use, and the structure of our programs and services. For more information about the hidden curriculum and how to identify the messages your library might be sending, visit the Glossary of Education Reform’s entry on this concept at https://bit.ly/2C0qKwM. Teen Advisory Boards (TABs) are a common form of ongoing programming offered at many public libraries. Teens or tweens involved in their library’s TAB may participate in a variety of activities, from providing input on collections to influencing library policy. In one public library, the focus of the TAB has shifted from advising to activism. After the shooting at Orlando’s Pulse Nightclub in 2016, the teen group at Kitsap Regional Library in Bremington, Washington, wanted to do more than discuss the tragedy—they wanted to do something about it in their own community. Assisted by librarian Megan Burton, the teens began planning issue-focused Teen Town Halls, creating service learning projects, and engaging with civic groups outside of the library to affect change in their communities (Burton, 2018). Read more about the Kitsap Regional group at https://bit.ly/2NRf5Sg. Within this one context, teens are learning in all three domains identified in this chapter: information literacy, traditional literacy, and dispositions. Looking at YALSA’s learning outcomes related to information literacy, it’s easy to see many connections to the activities of the Kitsap Regional TAB. Through their preparation for and participation in the Teen Town Hall events and the service learning projects, teens are learning how to communicate with others, leverage digital tools to broaden their perspectives, sharpen their research and reasoning skills, use existing materials in new contexts, express themselves in digital and face-to-face environments, and communicate their learning to each other and to other community members. TAB members read and write widely to prepare for the group’s activities and community initiatives, which strengthens their traditional literacy skills and exposes them to new forms of literacy. This practice both reinforces and expands the traditional literacy instruction these teens are receiving in their formal learning environments. build self-confidence through successful advocacy work. In this chapter, we have explored the “what” of public library instruction—the content and skills that public librarians can teach to the children and teens they serve. While there is not yet a single set of official learning standards for public libraries, that does not and should not prevent us from seeing elements of our practice as instruction and devoting time to exploring what it is that we are teaching children and teens through our programming, resources, spaces, and services, and what we want to teach them. The instruction offered in public libraries is not intended to replace the learning gained from education in schools or universities. Instead, library instruction should supplement formalized education through free access to resources and services representing cultures and ideas patrons may have no exposure to otherwise. In doing this, we can create an informed public and support the mission of lifelong learning. Public libraries are unique learning environments, and our curriculum should be unique as well. Once we understand what can and should be taught in a public library context, we must then focus on who it is that we are teaching within the library. As library professionals who serve the public, we need to be prepared to instruct a wide variety of learners with an even wider variety of interests. Our audience spans from babies to retired seniors—so pretty much everyone! No pressure, right? As Donna Gilton (2012) said, “Public library instruction can consist of different activities in the same time period for very diverse groups of people, different age groups and circumstances, as well as families and other groups in a completely voluntary setting” (p. 175). Knowing the community you are serving and their needs will help you craft curricula that will appropriately teach the material. In the next chapter, we will explore ways that you can get to know your learners collectively and as individuals, before exploring how to use that knowledge to plan relevant and powerful instruction. Duckworth, A. L., Peterson, C., Matthew, M. D., & Kelly, D. R. (2007). Grit: Perseverance and passion for long-term goals. Journal of Personality and Social Psychology, 92 (6):1087-101. Gilton, D. L. (2012). Lifelong Learning in Public Libraries. The Scarecrow Press, Inc.